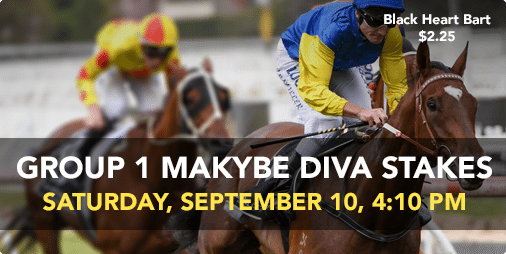 Will Black Heart Bart win the 2016 Makybe Diva Stakes? Racing Online - Tips - Will Black Heart Bart win the 2016 Makybe Diva Stakes? SUNNY skies are forecast this Saturday in Melbourne where the Group 1 Makybe Diva Stakes entrants are set to shine at Flemington. The $500,000 feature gives punters a taste of what’s to come this Melbourne spring carnival and with seven stakes races on the card, it looms as a big day for bettors. Saturday racing kicks off with the Sofitel Girls Day Out Handicap at 12.25 and punters will get up to $50 cash back at Sportsbet if their horse finishes second or third in the opening three races at Flemington. O’lonera has come of age this preparation with three consecutive wins at Caulfield and the transition to Flemington shouldn’t worry it. The Cindy Alderson-trained gelding hasn’t been tested of late and dropping down to 54kg in the weights is a big assist. Dwayne Dunn takes over from Nicholas Hall and the $3.70 is a good win price. Nick Hall will instead ride Almandin which has aspirations on the bigger spring races. The Robert Hickmott-trained gelding has been battling since returning from a spell in June, but its win in Europe over 2014 Melbourne Cup winner Protectionist was quality and it’s now getting up to its preferred distance. $11 is a good each way price. Black Tomahawk has won only four from 29 starts, but it runs well on this track with three placings. It flashed home late behind Au Revoir two back at Flemington and it challenged Refectory nicely last start. Bookmakers are respecting it at $4 and it should run another good race. My Country is a classy type which has won three from four and looked solid in a recent trial. It won the Lancaster Stakes last start at Eagle Farm over subsequent winner Invincibella and it arguably should have remained unbeaten after receiving a poor run at Randwick. It has drawn awkwardly, but consider the $4.80. Ariaz was well backed to win at Sandown last start and although this is a big rise in class, it flashed home late which suggests the increase in distance will help. Trainer Robbie Griffiths has a big opinion of this filly and after opening at $6, it’s now into $5.50. Super Too didn’t fire three starts back in the Magic Night at Rosehill, but its two subsequent starts have been impressive. The Marc Conners-trained filly won at Gosford by a half-length before backing that up with an impressive 4.3-length win. Drawn well here and the $9.50 is a good price. Tessera wasn’t too far behind Astern in the Run To The Rose last start and the form out of that race should stack up. The John O’Shea-trained colt won its first two career starts over My Country and Defcon and it wouldn’t mind some sting out of the surface. Looks a chance at $5.50 in an even race. The Ciaron Maher-trained Seaburge has a big future and it needed the run last start in the McNeil Stakes. The three-year-old is a winner of two from five starts which includes a VRC Sires’ win at Flemington. The increase in distance is ideal for this and punters should expect quick improvement. $5.50 is a nice each way price on offer. Zunbaqa has been the best-backed runner in the field. The Hayes/Dabernig-trained filly has rattled off four consecutive victories and after getting out to $8 in the market, it’s now a $6.50 chance with bookmakers. It hasn’t yet faced a field of this quality which is a major concern, but it might to follow any further betting moves. Prince Of Brooklyn opened as the $4.20 equal-favourite, but has since drifted out to $4.60. The four-year-old won at Caulfield two starts back before going close behind He’s Our Rokki last time out. The Mick Price-trained horse is rarely far away from the prize and it can handle all track conditions. This isn’t an easy field and punters will likely get a better price the longer they wait. Ulmann has also been on the drift and it currently at $4.80 after opening at $4.20. It won back-to-back races before finishing a disappointing fifth at Morphettville, but Flemington should suit better and it clearly didn’t handle the heavy track conditions last start. Damien Oliver jumps in the saddle for this and if it gets the right run, it will be tough to beat. There has been support for Tashbeeh which finished fourth at group one level in the Memsie Stakes behind Black Heart Bart. This is a much easier target and it saves its best form for Flemington where it has won three and placed in three from six starts. It has very little form on rain-affected ground, so monitor track conditions. Currently $4.80 after opening at $5.50. Defcon is coming off a last start win at Caulfield in the McNeil Stakes and that should be the best form guide for this race. The talented colt from the Snowden stables has missed the placings only once and that came in the Group 1 Golden Slipper. Forgive that effort and it’s form is stellar with a placing behind Astern in the Silver Slipper. The inside draw is ideal and the $3.90 is a respectable price. Saracino arrives from New Zealand having won the Foxbridge Plate as a maidener. The Baker/Forsman-trained three-year-old scored the win easily over the well-performed No More Tears and it has enough ability to cope with the increased pressure of Australian racing. The connections know how to win the big races so don’t underestimate its chance at $7. Archives hasn’t been seen since winning the Hampden Stakes at Doomben in May, but it looked good in recent trials and there’s plenty to like about it. The John O’Shea-trained colt wasn’t taking on the stiffest age-group competition last preparation which is the concern, but it’s a rangy colt with plenty of scope and it should only get better with time. Interesting runner at $6.50. Group one winner Under The Louvre was impressive when finishing second behind Redzel last start and its chances only improve on this track and at this distance. The Stradbroke Handicap winner is a six-time winner at this distance and punters know it will get back in the running and sprint home quickly. It opened at $4.80 and has drifted out to $5, but it still looms as a big winning hope. Also on the drift is New Zealand’s Xtravagant which failed in the Australian Guineas, but has since won the Breeders Stakes in New Zealand. The four-year-old has now won six from 10 starts and is capable of putting up big winning margins, but it’s also very enigmatic and needs everything to go its way. It might not get everything to plan down the Flemington straight, but it’s too good to ignore. Santa Ana Lane produced a big finish to run third last start and it has won second up. The Freedman-trained gelding won’t be suited by the inside draw, so expect it to settle back and try shift towards the outside running. It can handle all track conditions and it’s a dangerous proposition down in the weights at 53kg. $6.50 available with bookmakers. Darren Weir would have liked what he saw from Palentino last start when fifth in the Memsie Stakes. The four-year-old settled off the hot pace and finished off well which was an encouraging sign moving forward this campaign. It has won twice at Flemington which suits and expect it to fight out the finish at $6 in the betting. Black Heart Bart asserted its dominance last start when winning the Memsie Stakes. The Weir-trained gelding sat just off the pace and was too good for race-rival Rising Romance in the run to the line. The six-year-old has had only one start at Flemington, which should be of concern for punters, but it did finish second in that effort. It opened at $2.10 and has drifted steadily throughout the week to $2.35, but a top run is still expected. Our Ivanhowe is probably better suited over more distance, but it is a three-time winner fresh up. The last start Doomben Cup winner has placed once at the mile from two starts, but the betting suggests it could fire up in a fresh state. It opened at $11 and is currently at $10 so treat with caution. Badawiya is a four-win mare which is fresh up for Mick Price. The four-year-old has yet to miss a win or placing when fresh up and it is unbeaten in two starts at Flemington. Its most recent win on this track came when beating race-rival Don’t Doubt Mamma by 2.25 lengths and that should be a good form line for this. Not the easiest target in this situation, but consider at $6. Don’t Doubt Mamma was finishing off well behind Ocean Embers last start and it should be a much fitter horse here. The Tony McEvoy-trained mare is twice a winner on this track and three times at this distance, so the statistics read well and the inside barrier draw is only a positive. It has been backed solidly into $6 after opening at $7.50 earlier in the week. French Emotion has come for support after not getting much luck at Moonee Valley last start. The Chris Waller-trained mare was back behind runners before being forced to switch wide and it ran on well enough to suggest a good run will come in this. It has solid form this year and the light weight will help its chances. Each way hope at $7.50. Royal Rapture is flying under the radar despite having won four of its last five races. The Darren Weir-trained gelding has now won 13 from 43 starts and it scored by three lengths last time out. It carries more weight in this, but there’s no reason it can’t continue its winning streak. $5.50 is overs. Pilote D’essai finished second behind Royal Rapture last start, but it didn’t have much go its way. The French import won well in its Australian debut at Bendigo before travelling three wide to place behind Ulmann and again last start. Drawn wide again in barrier 15, but it’s a big chance with some luck and bookmakers are keeping it safe again at $3. Gabella had no luck at Caulfield last start and its run prior was a 1.5-length win at Morphettville. The seven-year-old hasn’t been tested in a field with this class before, but carrying only 54kg will help and it could run in the money at odds of $8.50.